Movie Review - 'Beautiful Creatures': Young Love, Supernatural And Southern-Fried The supernatural romance could well have foundered amid its unwieldy mix of dark magic and Dixie camp. But it somehow succeeds — especially when it casts aside complications and focuses on the simple story of young love in the middle of it all. Rated PG-13, for violence, scary images and some sexual material. Calling Beautiful Creatures a Southern-fried Twilight wouldn't be an unfair claim, at least based on its marketing campaign — which highlights that, yes, this movie centers on a teen romance between a couple of star-crossed kids, one of whom, yes, is all kinds of supernatural. And, yes, their love puts the fate of the world in danger, because, well, why not? Based on a series of young-adult novels by Kami Garcia and Margaret Stohl, Creatures is a flawed, tonally mercurial movie that struggles to translate its source material into a cohesive film. But without scenes consisting only of characters staring into each other's eyes, it immediately has more depth to offer than its pop-culture cousin. What its trailer doesn't begin to capture is that this surprisingly beguiling attempt to blend fantasy, coming-of-age drama, melodrama, camp and social critique isn't always successful — but it's nearly always entertaining. Ethan Wate (Alden Ehrenreich) is a bright, charismatic, high school junior quickly growing tired of his small Bible Belt town, the fictional Gatlin, S.C. While dreaming daily of going to college far away (and nightly of a mysterious raven-haired girl), he tears into Naked Lunch, The Catcher in the Rye and every other banned book he can get his hands on. He finds delight in his disdain for his classmates, who seem to be content to live and die in stifling Gatlin, a fate that recently befell Ethan's mother. Enter Lena Duchannes (Alice Englert), an abrasive outsider a far cry from the chatty Southern belles in Ethan's classroom; when those gossip girls say that Lena is a Ravenwood — a member of the wealthy, reclusive clan that founded the town — Ethan's interest is piqued. And before you can say "meet cute," Ethan is following her around, earnestly trying to befriend her. He's like a puppy trying to melt the heart of a cactus. Yet somewhere around the time she recommends Bukowski to him — he becomes an inarticulate bumble when he tries to quote it back to her — something curious happens: A movie that looks like a by-the-numbers teen romance (with so far only suggested by-the-numbers fantasy elements), this thing that would seem right at home playing next to The Vampire Diaries on The CW becomes something else: actually romantic. Ehrenreich and Englert bring a natural, extremely ingratiating chemistry to their scenes, a vibe that's only enhanced by writer-director Richard LaGravenese's dialogue — a restrained mix of playful, self-aware banter and real nervousness about approaching a state as defenseless as love. Lena, who's just lost her father, turns out to be a perfect foil for Ethan: She's of the exciting outside world he wants to know, and she would give anything to fit into a place as easily as he does. Their relationship's grand supernatural sticking point — because of course there's one — is that Lena's family is "different." 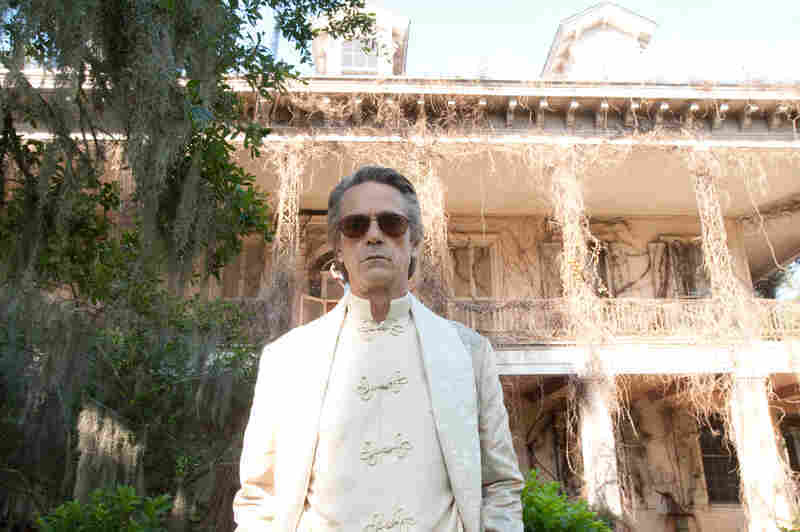 Jeremy Irons has fun with a Southern accent as patriarch Macon Ravenwood in Beautiful Creatures, even if he seems to be in a different film than the young lovers. "So, like, you're from Europe?" asks Ethan. Despite his talent for spouting disarming bits of folksiness, the fact that he's a mere mortal is a non-starter for "casters" (magic users) like Lena and her cane-wielding, cravat-wearing uncle Macon (Jeremy Irons), who vows to keep the two apart. The true problem is that when Lena turns 16 (a long hundred-plus days away), she's scheduled to be claimed by either the light or the dark side of magic — a fairly arbitrary event, and something that only female casters have to deal with, for some unspecified reason. The fate of the world is also involved, of course, since Lena's mother, Sarafine, is a powerful dark caster, and her forces are marshaling against Macon's. 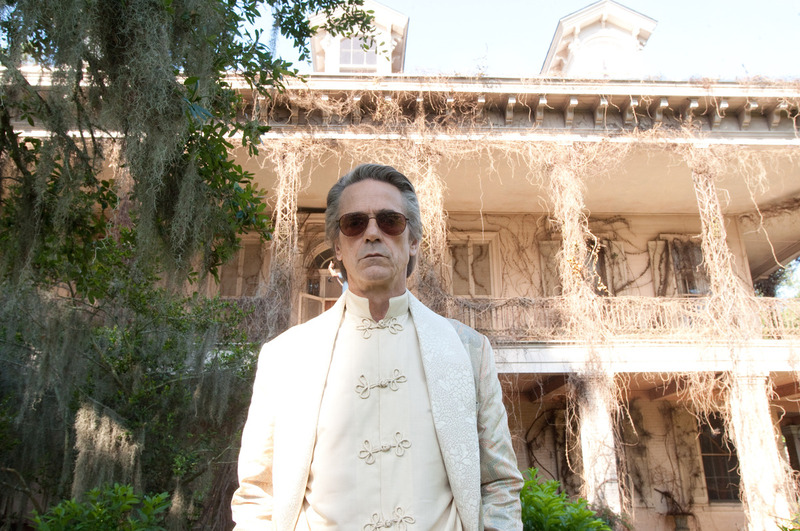 This all leads to some truly satisfying scene-chewery from Irons as Macon forbids Lena to see that boy again (and again), even if there are only so many times a variation on that scene can play out before Irons' delicious Southern accent starts to wear. Emma Thompson, too, gets in on the act of overacting with relish as the town's most conservative churchgoer; the malevolent Sarafine possesses her, and she and Macon have it out good in a not-so-subtle scene in one of the town's churches. Tone in Beautiful Creatures is a strange thing to keep track of; see above as regards camp, teen melodrama and social critique. While Ehrenreich and Englert fall in love in one movie and Irons and Thompson magically and verbally spar in another, Emmy Rossum and Viola Davis occupy individual universes of their own. Rossum, as Lena's seductive cousin already claimed for the dark, isn't so much chewing scenery as alternately screaming at or making out with it, while Davis balances the camp as a friend of Ethan's mother, the only person truly still looking out for him. Buffy the Vampire Slayer might be an apt comparison, given its appetite for banter, pop-culture references and the supernatural as metaphor for various coming-of-age struggles, but unlike that cult favorite, Creatures can't quite manage to tame its disparate parts into a single experience. The resulting mishmash is a lot like Ethan himself — full of aspirations, good intentions and eagerness to charm its way into your heart, even as it trips over itself. Creatures bogs down when it yet again rewrites its sometimes confusing mythology, and when its plot meanders waiting around for the days to count down to Lena's claiming — it's less ticking clock than sleepy swamp-gator lumbering — but the movie is at least savvy enough to circle back regularly to Ethan and Lena. The scenes where it's just the two of them talking and connecting as real people glimmer with a magic all their own.